Work Stress? Workplace stress is inevitable. It may affect you because of the pressure to perform, meet tight deadlines, excessive workload or simply having a difficult boss. Nonetheless, you should never let yourself stay with stress as it has both emotional and physical implications. Stress can alter your life and affect your social life and relations. Researchers from Harvard Business School and Stanford University did analysis on the stress levels employees in various workplaces. Their study showed that people in stressful workplaces were likely to die earlier. This fact highlights the importance of de-stressing and keeping your stress levels to a minimum. Although you cannot work without getting stressed, you can work towards mitigating the effects of stress. 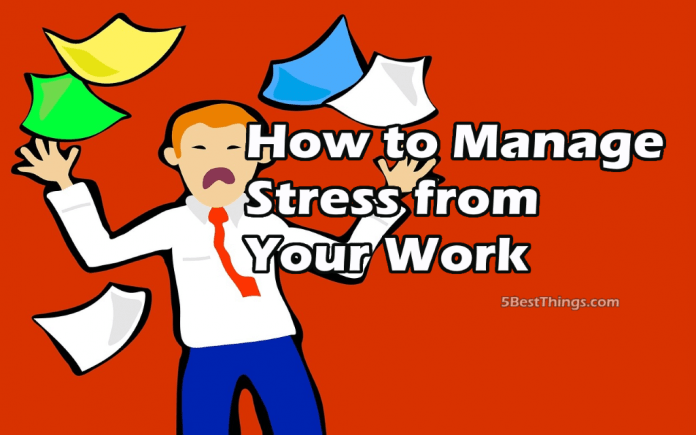 There are various ways to manage related work stress and prevent it from altering your lifestyle. One primary cause of work-related stress is all work and no play time. After a long day at work schedule some time for a workout. You can hit the gym for aerobic exercises, play a sport like soccer, basketball or attend self-defense training classes like taekwondo or judo. These methods of de-stressing make you sweat. When you sweat, your body releases serotonin which is also referred as the happy hormone. It helps to decrease your stress levels and relaxing your body. A 5-minute meditation each day has also proved to improved physical and mental health. Instead of staying at a bar drinking until late to drown your work stress, opt for a straight up old school method of de-stressing like running, boxing or playing your favorite sport. There is a saying that goes, ‘the mind is the key to everything.’ A relaxed mind equals a relaxed body. Relaxing your mind can help you to de-stress. As noted earlier, meditation relaxes the mind. Meditation lowers your blood pressure and helps you to control your thoughts. Listening to your favorite songs also contributes to relaxing your mind and releases stress. Music triggers happy hormones and aids your body in releasing tension. Moreover, if you can get a break from everyone for a moment and move your body to your favorite tune, the do it. So the next you have a tight deadline to meet and feel tensed, stop what you are doing, take a deep breath and think happy thoughts for a few moments. Social time is a healthy way to reduce stress. Talking to friends, laughing and sharing a joke will help your mind be at ease and in turn relax your whole body. Laughter is the best medicine, hence take a prescription. Having someone to talk to and share your stress related issues will make you feel better. That sense of support and communication releases oxytocin which lowers your blood pressure levels and reduces your stress hormones. Form friendships and have people that you trust at work to help you deal with stress. Sitting behind a desk for straight 8 hours causes your body to develop stress. It is recommended that you take short breaks of like 5 minutes after every hour. You can walk around the office, meditate or stretch your body. These simple activities will dramatically reduce your stress level and help you to concentrate on your work for improved productivity. Avoid burning out or accumulating stress. Always take some time from work to replenish and recover. Switch off from work and work-related activities. It is important to disconnect to allow your mind and body to relax and unwind. One of the principal causes of stress is trying to do things perfectly. Trying too hard to impress your boss, complete a task to perfection or prove a point to your work colleagues. There is nothing wrong with wanting to perfect something. However, if become a worry when you start to take things too serious that don’t matter much, building mountains out of anthills and overthinking. Don’t stress yourself with such. The beauty of life is simplicity. Make your days and life easier by not complicating things. Fewer complications and simplicity translates to less stress. Stress in the workplace cannot be eliminated, but we can reduce it and its impact. It is important to note that stress can affect your health and therefore it is recommended to deal with it. So whether you prefer to listen to your favorite tune, shoot some hoops, kick or punch a bag, just make sure you blow destress.